Swedish dramatic tenor; born in Stockholm Dec. 4, 1838; died at Christiania, Norway, March 7, 1897. He studied under Günther and Masset, and made his début in 1866 at the Stora Teatern, Stockholm, in Mozart's "Die Zauberflöte." During the season of 1868 he was engaged at the Court Opera, Dresden, and in 1869 he joined the Vienna Imperial Opera, with which he remained until 1883. Between 1884 and 1888 he appeared on several stages in Holland and Germany (Rotterdam, Bremen, etc. ), and in 1888-1889 made together with Strakosch a successful tour of the United States and Canada. In 1889 he returned to his native country. 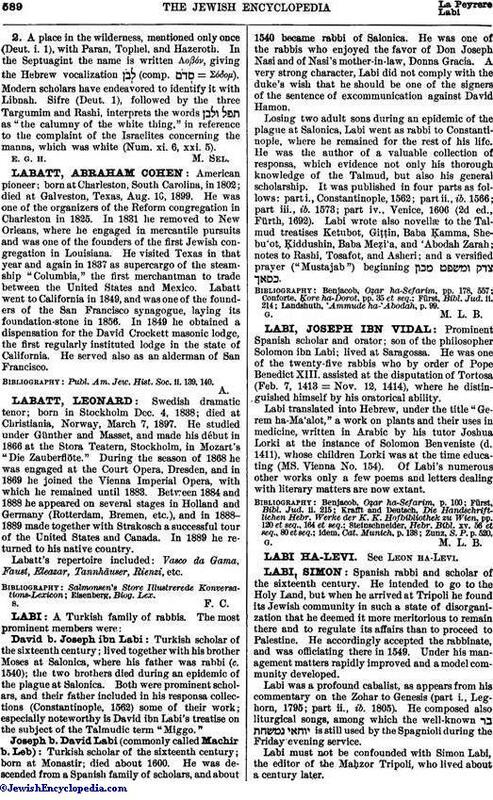 Labatt's repertoire included: Vasco da Gama, Faust, Eleazar, Tannhäuser, Rienzi, etc.